Your apartment search is finally over. You’ve found the perfect place in a great neighborhood, and you couldn’t be happier. Best of all—you found a pet-friendly apartment! If this is your first time living in an apartment with a dog, it can be a little challenging. How often should you take them out for exercise? How can you protect your belongings and your apartment’s floors? We’ll help you and your pup navigate the road ahead with these helpful tips. If you don’t already have a dog but you’re in the market, you should be selective in your choice. Many apartments have size restrictions to keep in mind. Even if size isn’t a concern, the breed can be an important factor. Some dogs, like Greyhounds, are happy to lounge around all day, while a Labrador needs lots of attention and room to run. If they get bored, they’re sure to start chewing up furniture or floors, so pick a breed that meshes with your apartment and lifestyle. Remember that you’re not the only one who lives in your apartment, and sometimes walls can be notoriously thin. While you want a dog to alert you of danger, try your best to minimize barking constantly or throughout the night. A little training can go a long way. If you’re considering bringing in a puppy, know that it can be very difficult to potty train in an apartment. If you need to take a flight of stairs each time your pup needs to go to the bathroom, it can be difficult for them to get the picture or hold it on the trip down. Try establishing a schedule for your dog to do the deed so they get into a habit of going at the same time every day. Training pads can also go a long way to helping your dog learn how to use the bathroom outdoors, but an even better option might be adopting an older dog who is already trained. Every. Single. Day. That is how often a dog needs leash time and exercise. If your complex has a dog park, it will make playtime much easier—plus, you may be able to make friends with other dogs and dog owners in your apartment community. 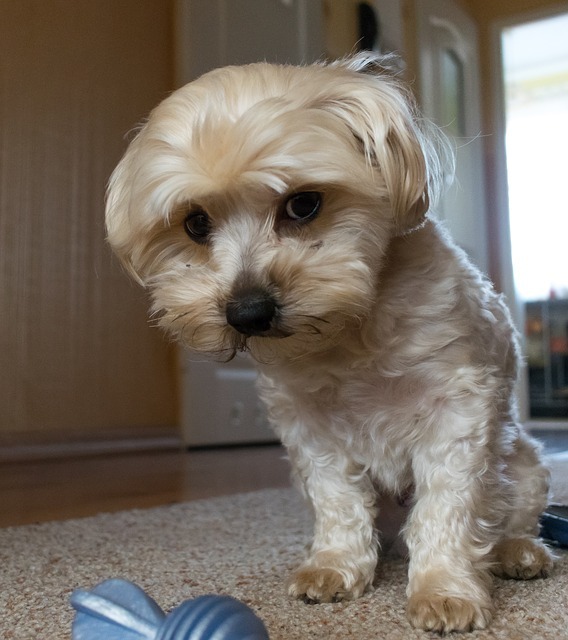 Pet fees can add up very quickly if your dog starts wreaking havoc on carpets or hardwood floors. For that reason, I suggest putting a heavy-duty mat in a designated play area for your pup. That way, the mat will protect his area, and if he does get too rowdy, you’ll only have a small space to clean or repair rather than an entire apartment. These are great tips!! My niece has a dog and lives in an apartment. I think she has worked hard to train him and he sounds like a good doggie. I know she enjoys taking him for walks and going to the dog park. Training is key. We had a dog next door in the apartment and it barked all the time. It was so difficult. I love dogs but that was too much. They ended up getting a bark alarm, and it totally worked!